Profile | Human Rights First Tell King Hamad bin Isa Al Khalifa - Kansas City, U.S.A. wants its medal back! 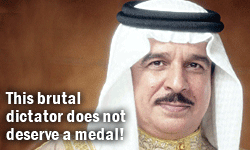 Tell King Hamad bin Isa Al Khalifa - Kansas City, U.S.A. wants its medal back! The crackdown in Bahrain against democracy advocates continues. Hundreds of people have been detained, at least four have died in custody and there have been widespread reports of torture. Bahrain's monarchy is headed by King Hamad bin Isa Al Khalifa and, according to his biography on the Bahrain's U.S. embassy website, he "was awarded the Freedom Medal of Kansas City, Missouri from the Mayor and people of Kansas City." Kansas City does not want to be associated with a repressive regime. We sent a letter to the Kansas City Mayor Sylvester James asking him to demand the Freedom Medal back from the Bahraini King. Add your name! Ask Kansas City Mayor Sylvester James to make clear that Kansas City does not stand with the Bahraini King’s appalling human rights record by taking back his Freedom Medal!